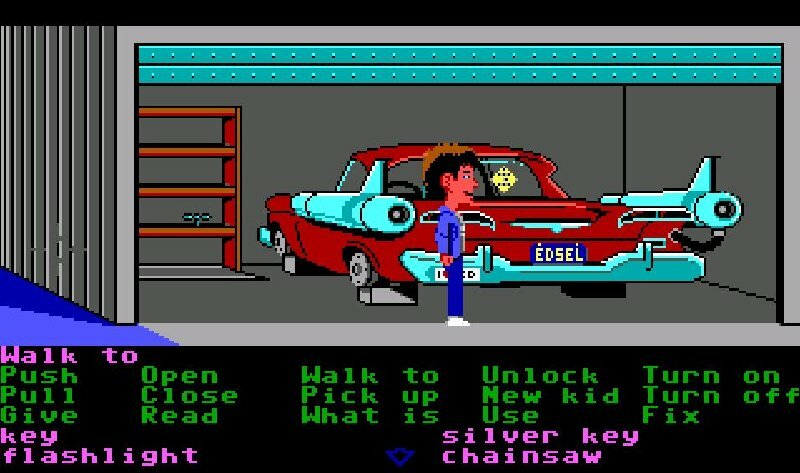 Maniac Mansion is a great game! I have to admit that I’d started to doubt myself in recent posts as I was whinging quite a bit about how difficult games (such as The Black Cauldron and Uninvited) were. 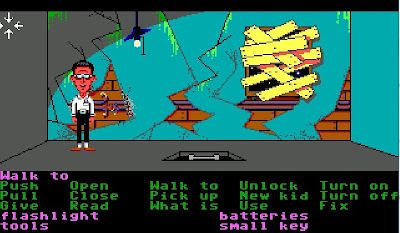 I’d started to wonder whether I was just being critical due to my inability to breeze through them, and that maybe I’d awarded Leisure Suit Larry such a high rating for the simple fact that I found it so refreshingly easy. 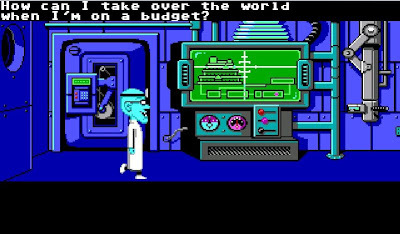 Maniac Mansion has made me realise that I wasn’t just being a wuss, and that my complaints were in fact entirely valid. This game is also really quite hard, and I’m making only gradual process through it, but instead of being frustrating it manages to be immensely enjoyable, and the puzzles are tremendously satisfying to solve. After my initial concerns about the seemingly random nature of the game and how the multiple pathways might affect problem solving, the hours I’ve put in since then have given me much more trust in the developers and the game itself. Regarding the random events, that concern turned out to be completely unfounded. I have no idea why Dr Fred captured Dave in the kitchen in my first couple of minutes. I simply can’t replicate the occurrence, so I can only assume it was an anomaly. Ever since then though, it has been my character’s actions that have caused the mansion inhabitants to move throughout the house, and there’s nothing random about it. Dr Fred or Dr Evil? Mike Myers or Maniac Mansion? To explain the above in more detail, the movement of the family members and the cut scenes that precede them, are not time driven. They occur only after the player has succeeded in completing certain tasks (no matter how long that takes) and not based on some unseen clock. This means the three playable characters can move around the house freely (apart from Edna’s and Fred’s bedrooms) without worrying about running into the enemy. Certain actions, such as emptying the pool or turning off the power, are required to solve certain puzzles, but they also set off alarms that cause Fred or his purple tentacle lackey to come looking for the cause of the problem. This just means that the player needs to really plan out their actions, and the solution normally involves multiple characters in just the right places. A great example of this is getting Bernard to fix the wires in the attic. To do so he needs to have tools and a working flashlight in his possession, but he can’t fix the wires while they are live as he would obviously be electrocuted. To turn the power off, someone needs to disconnect the circuit breakers in the nuclear reactor room, and for someone to get into the nuclear reactor room, someone else has to pull a gargoyle shaped lever to open the door and hold it down to keep the door opened. So, I used Wendy to pull the lever, allowing Dave to enter the reactor room and disconnect the circuit breakers, and then Bernard used his torch to be able to see while he fixed the wires with the tools. As long as you can complete the task and reconnect the circuit breakers before the purple tentacle arrives in the reactor room, you’re all good! Flashlight...check! Batteries...check! Tools...check! Let's do this! This might sound incredibly complicated, but a little bit of trial and error makes the solution fairly obvious. If you try the procedure without turning the power off first Bernard gets a shock. If you try it without having a working flashlight then Bernard is unable to see well enough to fix the problem. If you try it without tools, Bernard says that he can’t fix it with his bare hands. Of course it took me quite a while to get my hands on all the items needed, but once I had them, the solution was a matter of logic! Hence my earlier comment around the game earning my trust. As a player, I feel much more comfortable if I can trust that the solution to a puzzle is going to make sense. I can then put all of my focus into trying to figure it out with logic, rather than throwing random objects at it in the hope that something will work. 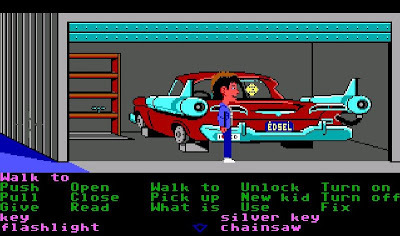 I can’t think of a single puzzle in Maniac Mansion that I haven’t solved with sound reason, and if I don’t have an item that could obviously assist with the obstacle in my path, I simply go looking for one. It’s absolutely amazing to me that it’s possible to finish the game without Bernard, as this obviously means that there are either completely different ways to solve puzzles like this one, or it’s not actually a requirement that they’re solved at all! 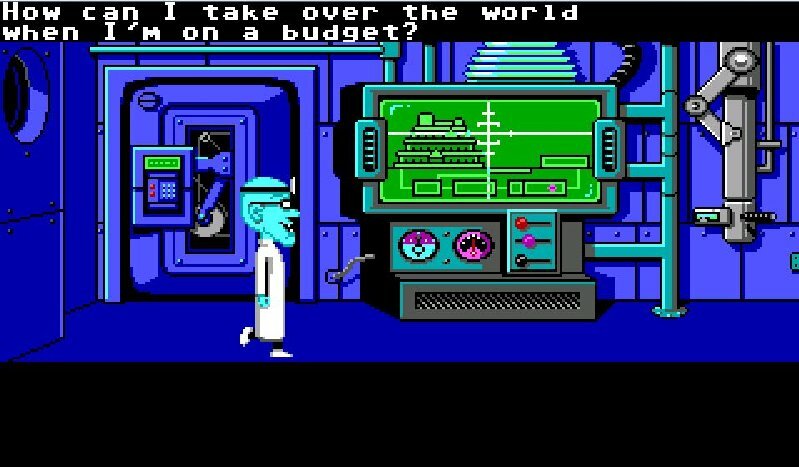 Either way, the replayability of Maniac Mansion is evident and impressive. The safe code on the wall is too small to read. I'm certain the solution will be a logical one. Over the last few days, I’ve had numerous highs and lows while playing the game, experiencing what I like to call “eureka” moments as well as “face-palms”. An example of a “eureka” moment was when I finally figured out what the cassette tape’s purpose was. I’d been trying for ages to figure out how I was supposed to get the key that was sitting in the glass chandelier (I didn’t notice it all for a couple of hours mind you) and had given up on the idea that I was going to be able to stand on something to reach it. It was then that I turned my attention to the record I’d found in the green tentacle’s room. I placed it in the record player in the piano room and turned it on, only for a piercing noise to burst out of my laptop and a vase sitting on the piano (in the game, I don’t have a piano) to explode. As soon as it happened I had a “eureka” moment, immediately understanding that I needed to reproduce that sound to explode the glass chandelier and drop the key to the ground. All I had to do then is figure out how to record the sound onto cassette and play it on the other cassette player that was oh so appropriately sitting in the same room as the chandelier. It’s moments like this that make playing adventure games so satisfying, particular when the answer you saw so clearly in your head plays out exactly as you expected it to. You probably already know what I mean by a “face-palm” moment, and I have a long list of examples I could give you. The most obvious one came after I’d spent over half an hour completely stuck. There were numerous things I knew I had to do, including locating a tap handle to turn on the water in the bathroom and get some tools for Bernard so he could fix the phone and the wires, but I simply couldn’t find the items I needed. I decided to go to every room in the house one by one, scouring them intently to try and find either of those items. The last place I went was outside the garage, but I still couldn’t see any way to open the roller door to find out what was inside. I’d moved the cursor all over the door several times, trying to find some sort of lock or handle, but couldn’t find anything, so I assumed what I really needed was a remote control of some sort. Just before I walked back into the house, feeling a bit depressed about not knowing what to do next, I just thought I’d try clicking open and then pressing the door. What do you know...it opened!!!! I must have visited the screen about five times and somehow tried everything imaginable without trying the most obvious thing of all. Face-palm indeed!!! Needless to say, the tools were in the boot of the car in the garage and the handle to the tap in the bathroom was sitting there on the shelf just patiently waiting for me to stop being an idiot. Face-Palm!!!!!! How was I to know that opening the door would actually open the door!? At this point I’d like to thank Ilmari and Amy for letting me know about the poster that came with the game. I’d already figured out most of the hints on it, including the key being hung from the ceiling and the door being painted over, but I certainly hadn’t considered using radioactive waste on the man-eating plant. As soon as I went back there, I noticed a hatch above it in the ceiling so the solution to that puzzle became very obvious. Unfortunately, I haven’t figured out how to pick up the radioactive goo on the floor in the reactor room, as none of my characters appear to want to touch it in anyway. Another puzzle that I’m currently working on is the games room, where I’ve finally managed to get power to the machines and opened the coin boxes with the key from Edna’s room, but can’t see any way to play the games. I have a dime in my inventory, which I thought was the obvious solution, but I can’t see any way to use it on the arcade machines. Finally, I still, despite a few of you telling me it’s possible and that there are numerous ways of doing it, haven’t found a way to escape the cell once one or two of my character have been captured, and have therefore been forced to restore for the time being. I opened the outer door using the glowing key, but the inner door code has alluded me (I assume it’s the code on the wall above Edna’s room, but it’s too small for me to read). I’ve been just as stuck on numerous other puzzles in the game before cracking them, so I’m prepared to go back in unassisted at this point. If I get REALLY stuck, I’ll comment here in the next 24 hours. Until then, wish me luck! Well at least I'm not the only one that couldn't escape this damn cell! I'm afraid you'll have to endure another "face-palm" moment concerning the cell... even if it's less obvious than the garage door. Great work by the way. I love your blog. Keep up adventuring! I hope my inability to solve the cell puzzle is at least giving the readers the chance to have a knowing chuckle to themselves. Admitting my failure is like standing up in front of the classroom naked with no idea just how well I measure up. sorry about the totally unrelated post, but I can't find how to contact u in private message. I've started my own blog today, and I'd love to have your advices and your opinion about it. If you have five minutes... Thanks a lot in advance. Let me set up some random email address that I can use for the site. I'd rather not give out my work address for obvious reasons. OK, now there's an email address in my Blogger profile. Look forward to hearing from you. About your facepalm-moment: in all likelihood you just unwittingly solved a puzzle, because opening the garage just isn't that easy. Probably you tried it once, and you were told that you didn't have strength for it - but afterwards you got Dave use the Hunk-O-Matic and develop his muscles so the garage door opened up easily. Once again Ilmari, I think you're absolutely right! I was wondering if the weights achieved anything. I must say that this puzzle was really lacking clarity. Very happy that I fluked resolving it. I'm glad you're enjoying the game so much. It should be pretty obvious why it's considered such a classic; it really seems a leap forward in adventure gaming, or at least a milestone in refining the genre. I really should get around to trying this again on the NES at some point. I seem to do well enough with games from my youth. I believe most of the games I considered beaten by me were probably a combination of me and my older brother.